A group of gentlemen held a dinner at a private club in St. Paul, Minnesota in January 1888 to mark the twenty-fifth anniversary of the Emancipation Proclamation, a wartime executive order issued by President Lincoln which freed the slaves in the Confederacy. 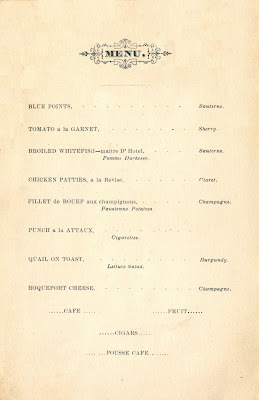 In addition to the bill of fare and list of toasts, the menu featured a remarkable seating chart. 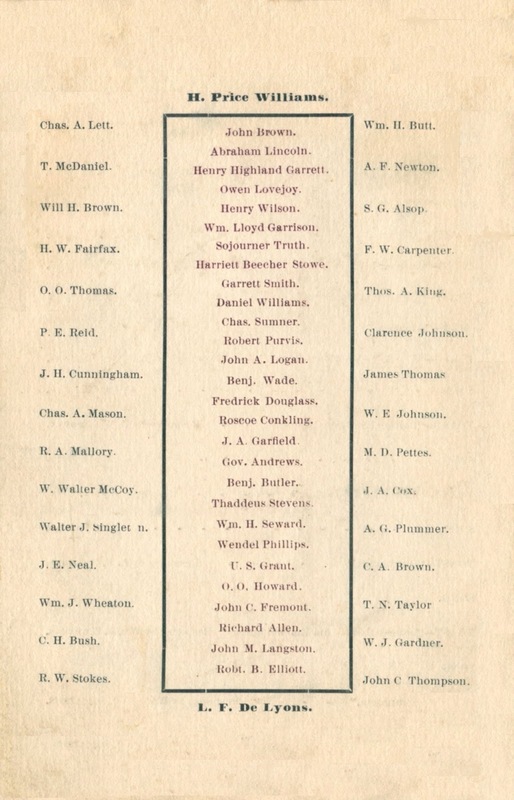 In addition to the participants, it included the names of leaders who were there in spirit, being remembered for the role they played in the struggle for freedom. 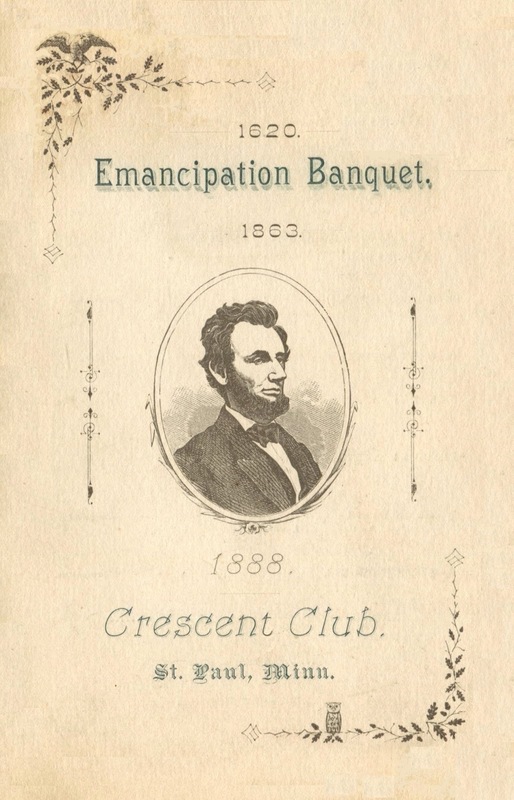 The event was held at the Crescent Club, an African-American social club on Cedar Street.1 After several hours of “cards and other light amusements,” the members sat down at 11:00 PM for a late supper. 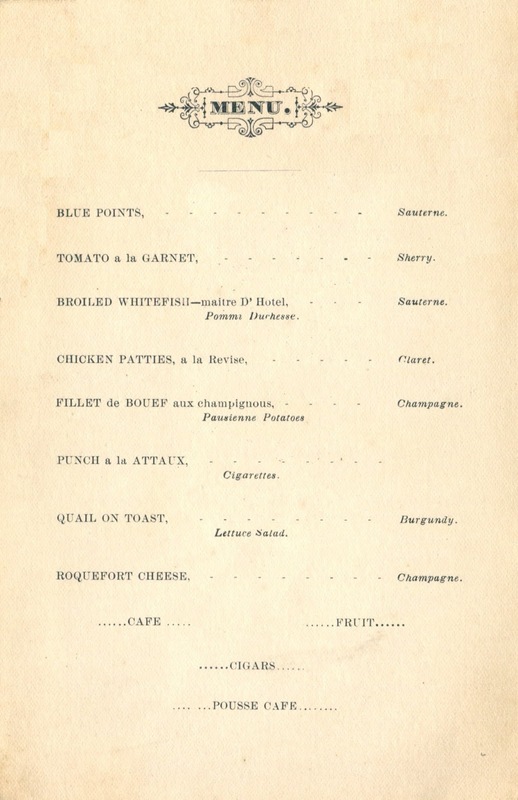 The cuisine and order of speeches on the menu follow the conventions of the era. The unusual seating chart appears on the back page. 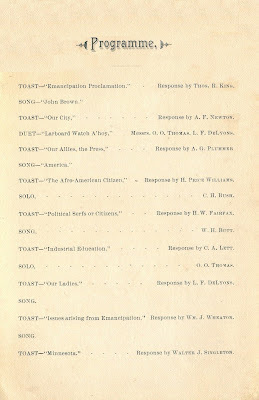 Some of the twenty-eight honorees are still acclaimed; others have been largely forgotten. 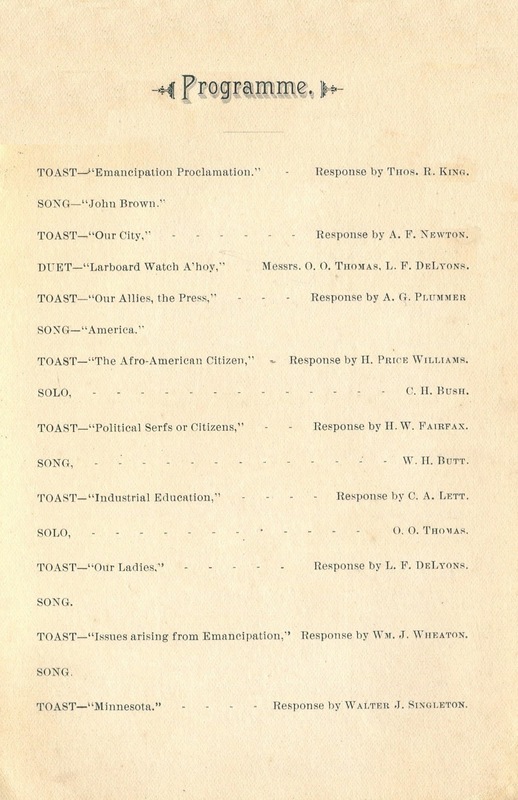 The list begins with the abolitionist John Brown and ends with Robert B. Elliott, an African-American member of the U. S. House of Representatives from South Carolina, serving from 1871 to 1874. 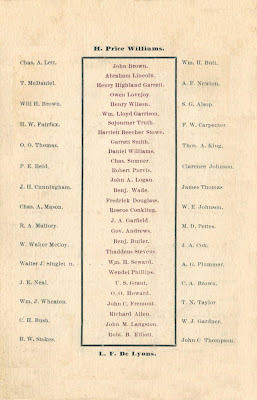 A lawyer by profession, he ran successfully for State Attorney General in 1876, but was forced out of office the following year when the last of the federal troops were withdrawn from South Carolina. Impoverished, Robert Elliot died in 1884 at the age of forty-one. Your menu articles are highly anticipated and always well researched. Rarely do I finish one of your blog posts without wanting to know more about the subject, and consulting the internet or an encyclopedia to find out more.